The global phenomenon, embraced by business worldwide and now published in more than 40 languages. Since the dawn of the industrial age, companies have engaged in head-to-head competition in search of sustained, profitable growth. They have fought for competitive advantage, battled over market share, and struggled for differentiation. Yet, as this influential and immensely popular book shows, these hallmarks of competitive strategy are not the way to create profitable growth in the future. In the international bestseller Blue Ocean Strategy, W. Chan Kim and Renee Mauborgne argue that cutthroat competition results in nothing but a bloody red ocean of rivals fighting over a shrinking profit pool. Based on a study of 150 strategic moves (spanning more than 100 years across 30 industries), the authors argue that lasting success comes not from battling competitors, but from creating "blue oceans"--untapped new market spaces ripe for growth. Such strategic moves, which the authors call "value innovation," create powerful leaps in value that often render rivals obsolete for more than a decade. 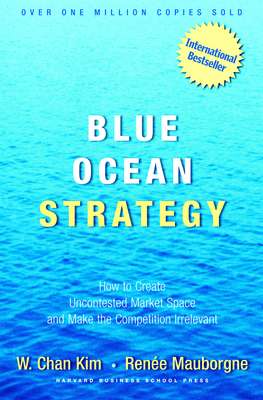 Blue Ocean Strategy presents a systematic approach to making the competition irrelevant and outlines principles and tools any company can use to create and capture their own blue oceans. A landmark work that upends traditional thinking about strategy, this bestselling business book charts a bold new path to winning the future.